If you have additional questions, please contact us and we will try to answer it as best as we can. The principal reasons for Driver Education are to make all of us who participate more skilled and safer drivers and to provide us with the opportunity to learn about our cars and to experience "driving in its purest form." The fact that this happens to be an incredible amount of fun is quite an extra bonus. Rally Sport conducts its driver education program mainly at Waterford Hills Road Race Course situated about 25 minutes north west of Detroit in a controlled and safe environment. Our program is designed to afford participants the opportunity to develop car control and other essential driving skills in an organized manner. People of various skill levels attend our events for a variety of reasons. The common denominator is that they have a great time and learn from their experience. Safety of participants and their cars is our number one concern. There are four run groups at Rally Sport events: Novice/Beginner (green), intermediate (white), advanced (blue) and instructor (red). The blue group is for very experienced drivers who would be lapping at roughly the same pace as the instructors. Participants will be assigned a group by the event chairman, based on their prior experience. Group placements are not final. With approval from the event chairman, you can switch groups if you find you are in the wrong group (either you're getting held up constantly in a slower group and need to move up, or you're holding people up constantly, and need to move to a slower group). The event chairman may also initiate such a move. There is no "ego" involved in which group you're in; it's all a matter of trying to put cars together that are lapping at similar speeds. As your skill level develops, you will naturally progress from the green group to the more experienced run groups. All participants in the green and yellow groups, plus some in the blue group will be assigned individual instructors who will ride with the participant throughout the event, or until, in the instructor's opinion, that participant is skilled enough to drive solo. It is unlikely that you will be able to drive solo at your first few events. Students are encouraged to drive at speeds at which they are comfortable, and learn the line, i.e., the proper place to be at any given time around the track. A primary goal is to learn better car control, which translates very beneficially to street driving. You can't learn anything if all you're doing is fighting to keep your car on the track. Additionally, participants are discouraged from traveling at speeds that could place them or their cars in jeopardy. It is important to note that Rally Sport Driver Education is not racing, nor any form of competition. There are plenty of other venues if you wish to drive competitively. Our program is not one of them. Early registration for all Rally Sport events is strongly recommended, particularly because entry fees are higher as the time gets closer to each event and the events fill up. Simply fill out the event registration form and mail it to the Rally Sport registrar. You may register for multiple events at the same time. If you enclose individual checks for each event, we will not cash the check until about two weeks prior to the event. That way you don't have to find a bunch of money early in the season. You will receive a confirmation of your registration about 3 weeks from the event. This will include instructions on what to bring with you and the tech inspection form. If you provide an email address on your registration, then this will be emailed to you. You will be expected to have your car inspected prior to the event. The requirements are clearly spelled out on the tech inspection form and are not onerous to meet. We do not generally do these tech inspections at the track. When you arrive at the track, several other last minute checks will be performed. For a more detailed explanation of tech inspection, read Peter Church's Tech Inspection Explained. All types of cars are welcome at Rally Sport events. Regularly attending marques include Porsches, Ferraris, NSXs, BMWs, RX-7s, Corvettes, Camaros, Mustangs, Jaguars and VWs. Generally we don't allow larger sedans to run. There is a special policy for open top cars which requires factory or aftermarket roll over protection. Click here for the complete policy. You will be required to specify on the tech form that you have checked the car and it meets the policy. Seat belts (restraint systems) and seats must be the same for both passenger and driver. WATERFORD HILLS ROAD RACING leases their road course to car clubs under the grace of an operating permit from Independence Township. The weekday operating parameters of this permit allow for vehicles that meet the following description to be allowed on the track for events between the hours of 10:00am – 5:00 (PM).
. . ."Production exhaust systems, totally stock type cars equipped with mufflers. Mufflers must silence to a maximum level of 75 dBA measured at the property line"
The hours of operation for club events that include race cars (defined as cars prepared in such a way as to be eligible to participate in WHRRI race and/or vintage events: and/or vehicles that have a history of participation in WHRRI, SCCA, CASC or other racing events) are from 12:00 Noon – 4:00 PM. Certain vehicles prepared to "Showroom Stock" specifications may be permitted to participate in the 10-5 category event. In all cases cars must be silenced to the 75-dBA limit. WATERFORD HILLS MEASURES DBA AT WEEKDAY EVENTS FOR COMPLIANCE TO THE ORDINANCE STANDARD ONLY. RACE PREPARED VEHICLES ARE NOT ALLOWED AT WEEKDAY EVENTS OTHER THAN OPEN PRACTICE SESSIONS AND SCHEDULED PRIVATE TEST DAYS. Our events are mainly held at Waterford Hills, and we provide all of the food and refreshments during the day. A fully functional auto racing helmet is mandatory. It must be rated as Snell SA2010 or later. Motorcycle helmets are no longer acceptable at Rally Sport events, though some other regions allow them. Rally Sport provides a limited number of loaner helmets for our events. Factory settings prescribed by the manufacturer are often too high for track driving, since tire pressures will rise dramatically with hard track driving. If you don't know what your tire pressures should be, ask a driver who is experienced with your car. If you don't know such a person, run the factory recommended pressures and see how your car feels. In all cases, be sure your tires are in good shape. Driver Education events place stresses on braking performance never experienced on the street. It is extremely important to make sure that your brakes are in tip-top shape! Brake fluid can boil on a hot day, indicated by a soft pedal. Slow down and cool down until the fluid has returned to functional temperature, or better still, end that session. There will be plenty more time on the track. Brake pads can become brittle and chunk through excessive heat cycles. This is detected by vibration during hard braking. ABS systems will set up the same vibration but they do less harm to the brakes. Complete your lap when the brakes vibrate and pull into the pits to inspect your pads. If you are not sure what to look for, ask any of the driving instructors. The completion of the tech inspection form requires that your brake fluid be no older than 90 days and that you have at least 50% of your pad remaining. This is important for your safety. Do not install new pads just before a DE event without breaking them properly in, or driving for 500 miles first. Brake rotors (discs) experience much higher operating temperatures as you learn to use them to their potential. Warped rotors can be a result of too much heat unless careful steps are taken to minimize this. Cool-down laps with very little braking are imperative to proper brake management and will extend rotor life as well as keep them from warping. After exiting the track after your session, keep your foot off the brakes as much as possible and let them cool off in the paddock. When the car is parked, keep the Emergency brake released and the car in gear. If the emergency brake is applied after a run, the rotors could easily become warped. In your registration materials you will have received a technical inspection form that is required to be completed prior to the event. Get this form completed at an approved facility or by an approved individual listed on the form. Remember we don't do tech inspections at the track and you will not be allowed to run without a completed form. This is a good time to go through your car and remove any articles which will not be required while driving and to remove items like telephones, radar detectors etc. Also make sure your battery, spare tire and jack are secured (or remove the spare tire and jack). Although an in-car fire extinguisher (mounted to metal) is not mandatory at Rally Sport events, participants should be aware that at some other region's events they are required. If you are planning events outside Rally Sport, please familiarize yourself with the host region's rules. The track gates are open by 8:00am to prepare for the day. Sign the necessary waivers on entering the track, and find yourself a spot in an appropriate location. Next, remove all loose objects from your car such as floor mats, bags, contents of the glove box and console, tool kits, radar detectors, unsecured cellular phones, etc. Anything that could fly around inside of the car should be removed. Proceed to the clean tech inspection line and bring with you your helmet and tech inspection form. Your car will be checked and the clean tech area of the inspection form will be completed. Remember we don't do tech inspections at the track. Proceed immediately to registration to pick up your registration materials. You will receive a run group bracelet, a run group assignment and number and an instructor assignment sheet. You MUST be wearing your bracelet at all times during the day, and have your run group number (color coded for your group) on your car on the front windshield at the center top and rear side windows (if you have them), or you will not be permitted onto the track. If you are changing run groups, you must change your run group number color to that corresponding with your new run group. After registration in the morning and a welcoming driver's meeting, the event begins. Rally Sport Driver Education days comprise of two instructional disciplines: classroom theory and in-car, on-track instruction. All novice through intermediate students will receive classroom instruction prior to their on-track instruction. This classroom time is mandatory. The advanced group will receive classroom instruction during the day. This classroom time is optional, however, most feel they have more to learn and attend. Classroom instruction will deal with the theory of high speed driving, car control techniques and the Waterford Hills (or other track) course layout. The more advanced the students, the more advanced the topics covered. On-track instruction also varies with the experience of the student. For complete novices, the instructor will take a couple of laps to drive the student around the track. This will be done at a moderate pace, with emphasis being placed on describing the track and where it goes. Then the student will take to the track. The instructor will concentrate on smooth driving and learning the correct "line" through the corners and around the track. The correct use of braking and gear shifting will be emphasized both on the track and in the classroom. As the level of experience increases, the focus of the instruction will move to more advanced techniques including heal and toe shifting, trail braking and left foot braking. You will always have access to an instructor to help you. Plus, you are encouraged to seek out your instructor and ride with them so that, for example, you can get an understanding of what they mean when they describe something for you to do on the track and you just don't seem to quite understand, as well as seeing what a high performance car is really capable of. Generally, there will be four track sessions, totaling approximately 100 minutes. Here's an overview of each of the groups. This group is for novice track drivers (1-10 times out on a track), people with cars that are slower than most of the other cars at the event or people with some track experience who know they want to drive slowly that day. Passing is only on the back straight at Waterford (other tracks have other rules, but still only on the straights), only on the left, and only with a signal from the car in front of you. There is NEVER passing in the corners. This group is for more advanced drivers (typically more than 10 times out on a track). Just because you have a slower car doesn't mean you don't belong in the this group. An experienced driver in a Miata will be lapping faster than less experienced driver in a Porsche Boxster or other higher horsepower sports car. Passing rules are the same as in the green group. There is NEVER passing in the corners. This group is for track drivers with significant amounts of track experience (always more than 10 times, more normally 25 plus track events), who will be driving at much faster pace than drivers in the slower groups. Passing rules are the same as in the green group. There is NEVER passing in the corners. Most cars in this group will have 5 point harnesses and other safety equipment. This is the instructor group. Passing is on any straight, however, a signal must always be given. Passing may be on the left or right. And, there is still NO passing in the corners, even though many of the drivers on the track are experienced wheel-to-wheel racers. Remember, ego should not be involved in any part of the Driver Education event or your run group assignment. If you find yourself in the wrong group, we're flexible in allowing you to change. Let's re-emphasize that there will be NO PASSING IN THE TURNS. This is DRIVER TRAINING and NO WHEEL TO WHEEL RACING WILL BE ALLOWED! The drivers’ meeting, usually at 9:00 a.m. at Waterford Hills, earlier at other tracks, is mandatory. Roll call will be taken. If you miss the drivers' meeting you will not be allowed to run during the event. A wide variety of things will be discussed at this meeting, including passing rules, the use of flags and instructor assignments. Open lapping begins at 10:00am at Waterford Hills and usually around 8:00am to 8:30am at other tracks. The schedule will have been provided to you at the time of registration along with instructor assignments. Safety is first and foremost. Both you and your car must comply with the following regulations. Failure to do so will result in your disqualification from the event. All participants and guests entering the Raceway must read, comprehend, and sign the Release and Waiver of Liability and Indemnity Agreement. You must have paid your fees, be wearing your bracelet (if used) and have your run group sticker/number on your car before you will be allowed onto the track. This is not a competitive event. Racing will not be tolerated!!! Know and obey all flags. Passing is permitted only in designated zones, only on the left and only after the passing signal is received. One signal per car passing. The car being passed must slow to allow the passing car by. A pass must be completed safely and in time. No late passing please. Slower cars must let faster cars by at the next passing zone. If you spin or have more than two wheels off the track you will receive a BLACK FLAG and have to report to an official in the hot pit lane. Even if you do not receive a black flag, you must come in. Only instructors may be passengers in the non-instructor run groups. Instructors may take passengers, so long as the have signed the event waivers and are at least 18 years of age. No alcoholic beverages of any kind may be consumed by ANY person during the event, or brought to the track. The use of drugs is strictly prohibited. Prescription drugs that may cause drowsiness must not be taken. You are responsible for determining whether you are fit and healthy enough to participate in the rigors of a track event. When driving, any window where there is an occupant must be completely down. Thus, if you are driving alone, only the driver's side window must be down. If someone is in the passenger seat, both windows must be down. Cars must have equal (same) seat belt restraints for both driver and passenger. Open top cars must have roll bars. The top of the helmet of the driver and instructor must be below the line drawn from the top of the windshield to the top of the roll bar. Because safety is our number one concern, the regulations reflect this concern. The event officials reserve the right to disqualify any participant who fails to abide by these regulations. Rally Sport allows passing at certain specific “passing zones.” Passing in any other area of the track will cause you to be black flagged. If you persist, you will not be permitted back out onto the track. Passing zones and procedures will be explained at the drivers' meeting just before the event. In the event that your car is disabled, pull off the track as close to a flagging station as possible. Do not attempt to make repairs, and do not get out of your car. In the event that another vehicle is stopped, do not stop to offer assistance yourself. The track officials will deal with the situation. Your instructors are experienced in performance driving at various tracks. Many of them have obtained competition racing licenses and have driven thousands of laps around race tracks at speeds and cornering limits above those which you will experience during your driving sessions. Your instructors will be most impressed by smooth driving and following the proper line. They know that these techniques will result in safe high speed driving. They have been instructed to attempt to keep you from getting in over your head and may ask you to slow down so that you can better follow the line. Feel free to ask for a different instructor at any time--simply pull into the pit and indicate you'd appreciate another perspective. You may wish to ask an instructor to drive your car to demonstrate techniques to you. You can learn a lot from this experience, but are not expected to do this and should feel no obligation to do so. However, if you do have an instructor drive your car, the instructor will drive in a way that does not make you feel uncomfortable, and should ask you how hard you would like him/her to drive. Your instructors have their own sessions throughout the day, and it is part of their duties to take participants out as passengers in their vehicles. This can be a very informative and exhilarating experience, and it is highly recommended that you take advantage of it. One last note about instructors: It's not a good idea to scare them! Fast/Dry: Watch the line for rubber and oil, use the wet line if you feel slippery. Wet: Move off of the line a full tire width; this will improve traction. Listen to your body. Drink a LOT of water, don't eat excessively, and do not exceed your limits. Body fatigue sets in very fast on a track event. The lapse of mental focus is the first sign that you are wearing down. You will notice that it becomes more difficult to execute the perfect line through turns, and shift points become erratic. Slow down for a lap or two to regain strength. As in distance running or any athletic event, a short break will allow the body to rejuvenate. If, late in the day, you feel yourself drifting off of "the line" and having a harder time driving smoothly, you are probably mentally tired and it would be a good choice to pull into the pits and call it a day. Driving at speed is one of the most cerebral things you will do. Race drivers will condition for years to prepare for a 20-minute test. Safe cornering requires a conscious and repeatable sequence of driver actions to enter and exit turns properly. This sequence must be smooth and flowing and requires regular practice to make it a habit. The sequence is as follows assuming turn entry from a straight section of the course. LIFT: While driving in a straight line and looking ahead, smoothly lift off the throttle. BRAKE: Smoothly and progressively apply the brakes in a straight line. Not all turns require use of the brakes. DOWNSHIFT: Downshift (using heel-toe technique if you're familiar and comfortable with it) to the appropriate gear to maintain torque to provide for acceleration out of the turn. Not all turns require downshifting. OFF THE BRAKE: While looking ahead to the apex and beyond, smoothly release the brakes when you're ready to turn in. You do not want to be braking while in the turn. APPLY THROTTLE: Gently apply at least a little bit of throttle to set the suspension of your car before turn in. TURN-IN: Practice ocular driving. Never look where you are. Always look ahead to the next point by physically turning your head. Slowly and smoothly turn the wheel to initiate the turn. Let your hands follow the eyes and use progressive steering. ACCELERATE: After the turn is initiated smoothly, smoothly apply more throttle and progressively increase as you pass the apex and begin to track out to the track-out point. TRACK OUT: As you pass the apex smoothly and progressively open the steering wheel. Let the car unwind to the track-out point. However, this is not always needed or desired. Your instructor will explain when and how. At the end of the run group, as you slowly and safely turn to the paddock, review the session with your instructor. Identify areas and skills you feel comfortable with as well as turns and skills you need to work on. Be absolutely sure you have the course memorized turn by turn in order. Use the course map to relive the session and talk yourself through each turn over and over. Lift, brake, downshift, off the brake, throttle, turn in, more throttle, track-out. Visualize every turn in order and include any improvements needed. Visualize and memorize one perfect lap after another. Recognize mistakes but do not dwell on them. Always visualize a perfect lap. POOR DRIVING POSITION: Check to see that fully depressing the clutch pedal doesn't require maximum leg extension. Check to see that reaching the steering wheel still leaves a slight bend at the elbow. Check the seat belt and helmet strap. POOR HAND POSITION: Depending on exact steering wheel design, proper hand position is approximately 9 to 10 o'clock for the left hand and and 2 to 3 o'clock for the right hand. Avoid changing these hand positions once on the track, "crossing over" when making turns and not returning to the steering wheel after shifting. For tight turns, learn to shuffle steer, i.e. move your hands on the wheel so that in the turn, they're still at roughly 9 and 3 o'clock. ABRUPT USE OF CONTROLS: Steering, brake and throttle. Smoothness is a basic skill/minimum requirement. Pumping the brakes, lack of effective, consistent brakes. FAILURE TO USE ALL OF THE TRACK: to get biggest (fastest) radius. "CREEPING IN:" from the edge of the track near turn-in point. EARLY APEXING: Early turn-in caused by impatience or too much pressure/over-driving. ---failure to recognize the "acuteness" of the corner (angle). "DROPPED" CLUTCH AFTER TURN-IN POINT: Too late with all the decisions, putting this one after the turn-in instead of before! Big spin risk if the car is near the actual limit. SHIFTING GEARS WHILE IN A CORNER: unnecessary/risky, other than in very limited circumstances. "LATE" TURN-IN: Usually caused by failure to recognize that the turn is (probably) less than 90 degrees. Spin risk as student tries to wrestle the car to the proper apex in spite of the late turn in. BRAKING TOO LATE: Problem is worst when consequences are at maximum! Largest errors are made when the difference between straight-away speed and cornering speed is large. Students tend to enter slow turns too fast (and fast turns too slow). FAILURE TO BUILD BRAKING (PRESSURE) SMOOTHLY ENOUGH: to prevent "locking" of tires. If the fronts lock first, the student will lose steering control. If the rears lock first, there will be immediate directional stability problems. POOR USE OF RPMs: Failure to use tachometer to shift at appropriate times, missing up or downshifts completely. Over rotation of the car with too much trail-braking and/ or sudden and jerky steering motions (oversteer). Throttle too soon, no rotation, front "push" (understeer). TRAILING-THROTTLE OVERSTEER: "Dropping" the throttle abruptly when in the corner. This is an all-too-typical reaction to the mid-corner realization of having made an error. Solution: the idea of "temporarily taking a slightly larger radius." Suggest to: momentarily steer "out" with a steady throttle. POWER OVERSTEER: Too much power applied, too abruptly, with car already near critical grip limits. (rear wheel drive, high hp/torque cars). FAILURE TO RECOGNIZE MISTAKES: Failure to accept the necessity for full concentration and discipline. Symptom: inconsistency. FAILURE TO ANTICIPATE AND ADJUST: as speed changes require. PREMATURE EMPHASIS ON LAP TIMES: if you are keeping track of them. Failure to realize/accept that nobody starts "on top" or gets there easily. FAILURE TO DO MINIMUM CAR PREPARATION: Basic safety demands appropriate tires, suspension and brake pads/brake fluid for usage. Significant re-checking at track (i.e. tire pressure). We hope these pointers haven't overwhelmed or confused you. It is important to realize that it is the laws of physics which determine what your car can and can't do; if you try to break those laws, you'll get caught every time, and the penalty you pay can be very high. REMEMBER, SMOOTHNESS, CONSISTENCY, CONCENTRATION AND MOST IMPORTANTLY--HAVE FUN. The track is open and clear for use. This flag will be displayed for one lap after the caution flag has been shown. Also known as the CAUTION flag, this will be displayed for the first lap of the open lapping session for each run group. No passing is allowed whenever the YELLOW flag is displayed. If the flag is waved it indicates that there is a serious problem just ahead, possibly a car or other obstruction on track. Slow down, and proceed with caution! This flag means something major has happened and the track is being shut down. When red is displayed, the first thing you should do is look in your mirrors. Then apply your brakes smoothly and firmly until you come to a stop. Stay in your car where you are and you will be advised by someone (a corner worker or Rally Sport official) when you may proceed. Remember, stay in your car!!! This flag means there is a problem with your driving and/or car. Slow down and come into the pits and stop in the hot pits at Start/Finish to talk to the Pre-grid controller. If you are not sure if the black flag is meant for you, it is still prudent to come in and check with the Pre-grid controller. If a black flag is shown at all corners slow down and come into the pits. This flag, sometimes called the MEATBALL flag, means that the turn workers have noticed a problem with your car. Slow down and come into the pits and stop in the hot pits at Start/Finish to talk to the Pre-grid controller about your mechanical problem. 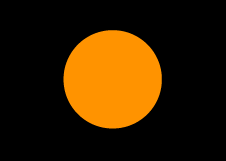 This flag, commonly called the PASSING flag, means that you are being overtaken by cars that are faster than you in the corners, even if you may be much faster on the straights. When you see this flag, look in your mirrors. Signal and allow faster cars behind you to pass at the next passing zone. And remember: if a car is right behind you, he/she is probably faster than you - Scotty didn't just beam him in there! 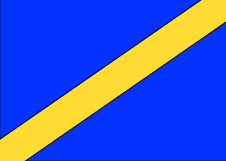 This flag indicates that there is an ambulance or slow moving vehicle on the track, which could be moving in the same direction or the opposite direction. Please be on the lookout for it. This flag will be shown together with a black or red flag. Obey the black (come into the pits) or red flag (slow down and stop). You may pass the vehicle carefully when you come upon it. Referred to as the OIL flag or DEBRIS flag, this flag indicates oil or debris on the track, or slippery conditions. The flag will be waved at the location of the problem for one or two laps. Caution throughout the session is recommended. Just because the flag isn't being waved throughout the rest of your session doesn't mean the problem has gone away. This flag means the driving session is over. Slow down and allow your car to cool down. Exit the track at the end of the lap. This flag will be displayed at Start/Finish only. Passing after the checkered flag is not recommended. 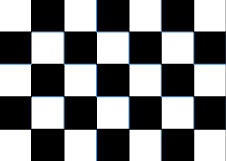 DO NOT BLOW THE CHECKERED FLAG!! Aside from being black flagged, you will know that 20-25 other cars are sitting there at Pre-grid, waiting for their session to begin, watching you go around the track BY YOURSELF! Our track chairman Christian Maloof can be contacted at cmmaloof(at) gmail.com. Our track registrar Tom Krueger can be contacted at RSRregistrar(at) gmail.com.